Come along on a shopping trip of epic proportions, exploring quaint towns and villages with leafy-tree lined streets, heritage buildings and a ton of history on every corner as we visit some of the Hills’ passionate shopkeepers. Our day starts on Gawler Street in Mount Barker via the winding roads of Stirling and Crafers – 40km from the Adelaide CBD, and 10 minutes from Hahndorf. The historic Auchendarroch House (built in 1860) sits atop the street which is lined with cool cafes and quirky shops that give this country town an edgy vibe. 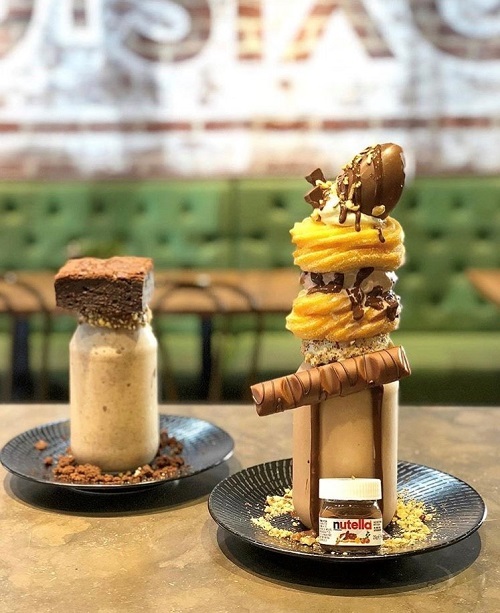 We stop for coffee at Sazon, a short walk from Brother Bear Wholefoods and 50Sixone – home to Insta worthy mega shakes and desserts. It’s a chilly autumn day so the warm coffee is welcome as we stroll both sides of the leafy street past florists, gift shops and impressive fashion and homewares boutiques like Pearle Boutique and Farrago. Back in the car, it’s a short drive to Nairne up Bald Hills road. A vintage evening gown handmade in Kuipto in the 1940s hangs delicately from the ceiling, while fur stoles and designer wares adorn the racks the in front of us. 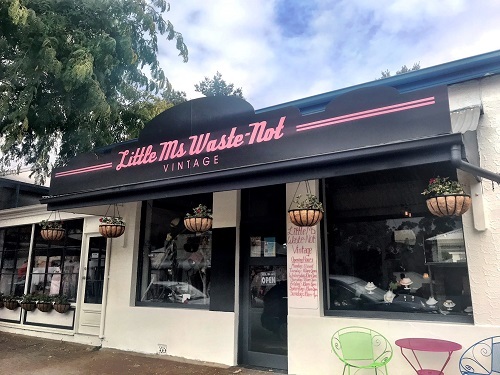 Welcome to Little Ms Waste Not Vintage – a treasure trove in the up and coming tiny town of Nairne in the heart of the Hills. You’ll feel like you’ve stepped back in time on the main street which is reminiscent of an old farming town blending shopfronts from a bygone era with incredible new stores like Pallet Home + Table - a two-storey café and homewares store giving this tiny town some serious street cred. Along with the holes in our wallets, we’ve worked up quite an appetite so lunch in Woodside 10 minutes away is next on the agenda. We’re spoilt for choice with artisan cafes in historic buildings like the Woodside Providore showcasing Adelaide Hills wine and produce and Avalon of Woodside (good for groups and doubles as gift store). Bellies full and shopping energy reignited, we walk the main street in search of more treasure. An artisan jewellery studio, bric-a-brac, modern gifts and homewares stores later, we stumble on The Warehouse at Woodside – the ultimate collector’s paradise down an unsuspecting alley. One person’s trash is another’s treasure is the first thing that comes to mind, until we’re inside marvelling at the antique glass and silverware. A bookshelf filled with vintage reads catches our attention and I pick up a classic story book with a personal message addressed to the recipient dated 1915. Now that’s cool. Just five minutes up the road, the blink and you’ll miss it town of Charleston is next on our drive. 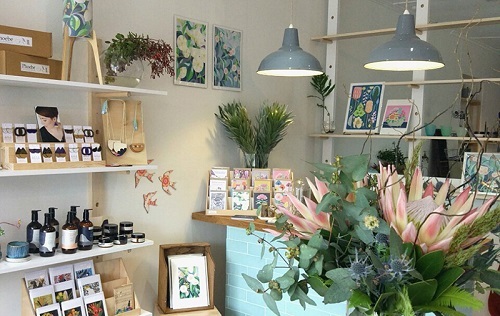 You can’t miss Pony - an incredible gift, clothing and homewares store on the main street. It doesn’t disappoint! Back down Onkaparinga Valley Road to our last stop, Balhannah – a mature, more established version of Nairne. A whirlwind stop into art and design store Field Trip, and homewares mecca Living by Design completes our memorable Hills’ shopping day, along with a bag of freshly picked Gala apples from The Olde Apple Shed on route back to Adelaide. Head up Glen Osmond Road to the South Eastern Freeway following signs to Mount Barker, a 40-minute drive from the Adelaide CBD. Ten minutes from Mount Barker up Bald Hills Road via Springs Road leads you into Nairne, before a 12km drive from Nairne to Woodside via Woodside Road and Nairne Road. Just five minutes from Woodside on Onkaparinga Valley Road, you’ll hit Charleston – the slight detour is worth it. Head back down Onkaparinga Valley Road for 11km to Balhannah, before heading back to Adelaide via Greenhill Road through Uraidla and Summertown past the Cleland Conservation Park – it’s 5km longer but oh so worth it. Originally published in the Sunday Mail, 8 April 2018. Words by Natalie Turns.